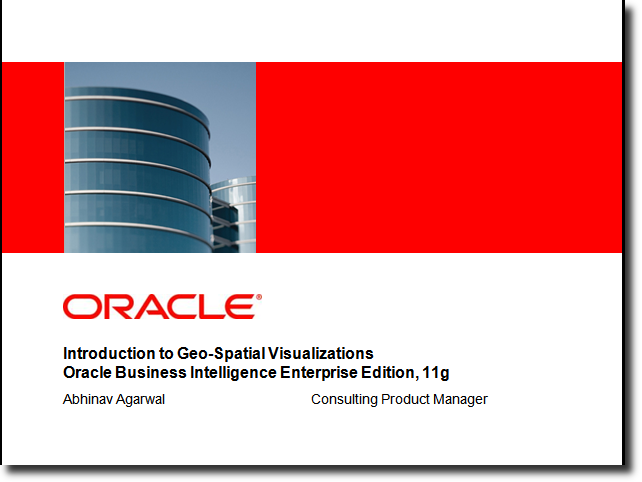 Wrapped up an Oracle University webcast a few hours back with a colleague, Ken Player, on visualizations in Oracle BI EE 11g. 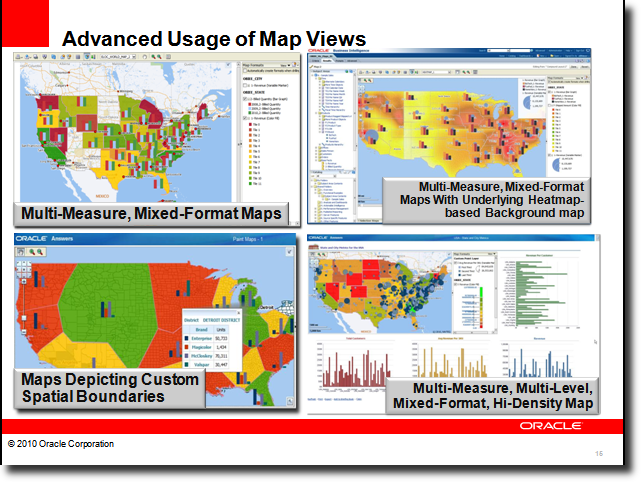 It covered areas as the new charting engine, interactivity controls, and my favorite - map-based visualizations. Some screenshots from the session; will provide details in a day or two. We split up the webcast into three parts. Ken did the introduction and covered visualizations. 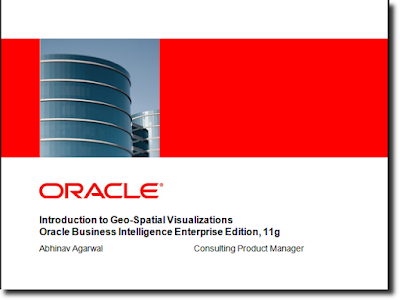 I covered spatial visualizations and the demo. This slide is where we did the handover. 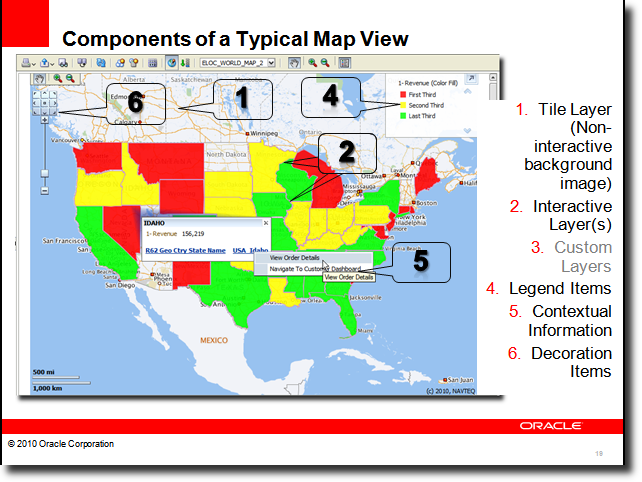 This slide below calls out, using the same background map, all the six formats you can create with Map Views. The color fill, or choropleth as it is also sometimes referred to, is by far the most popular, and can be put to great use when used in conjunction with the interactive color format slider in OBIEE 11g (more on that in a future post). The bar and pie graphs are useful if you want to display data across two dimensions. For example, when displaying Revenue data by Country, you can use the bar graph to split that data by product category, or by quarter, or year. The bubble is useful in its own right since it uses size as the metric variable to call attention. It has an advantage over the color format since the main attribute of the format - the size of the bubble - is based on the metric itself. Unlike in the color fill, where the size of the underlying region can distort perception. A large swath of red over Wyoming versus a small patch of green over New York - are they the same? Not really, because the red appears more prominent because of the size of the state of Wyoming. The area of the color fill in this case is independent of the metric being plotted. Hence the potential for confusion. The variable shape can be used to great effect if you choose to base the color of the shape on a second measure. Then, both the color and size can be used to convey information. Neat. And finally, the image format. Need a coffee cup image? A burger icon? A happy smiley? Go crazy with the image formats. And this has some advanced uses of Map Views. In the first example ("Multi-Measure, Mixed-Format Maps"), you can plot more than one measure for the same level using different formats. So REVENUE-per-STATE is rendered as a color fill. While UNITS-per-STATE-per-YEAR is rendered as bar graphs. The second is basically the first map, but with a different background map. You can choose to have a basemap that utilizes a heatmap advanced format to render a completely different, possibly non-BI metric. Like population density. Or income distribution. Or age distribution. Or something else. And then create a map format on top of this basemap. The third shows that you can use CUSTOM boundaries, and quite seamlessly, in Map Views. Saying "US-Midwest" is not really the same as viewing it on a map. And finally, maps as the ultimate, lossless, high-density data visualizations. Almost 2000 cells worth of data on that single map. Yes. Data for 40+ states based on one metric. That's some 80 cells of data. Then you have data for 500+ cities, rendered as a variable bubble shaped format, where the size is based on one metric, and color based on a second metric. That's 500 + 500 + 500 cells. And finally a brief look at the components of a Map View. There are basically two main parts of a map. 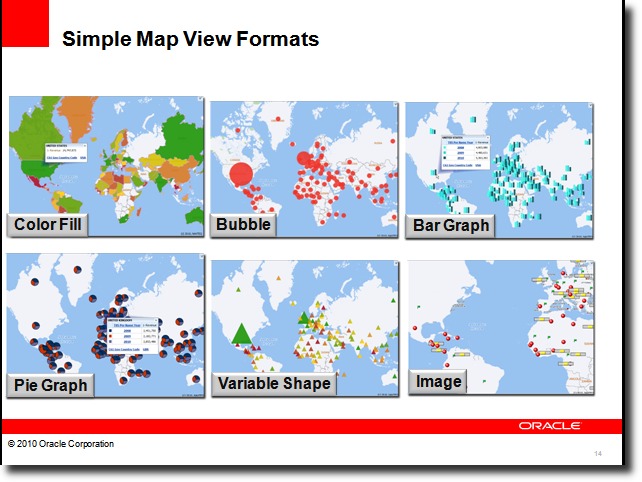 The first is the basemap, or background map as we call it. And the second is the interactive format.